July’s produce log has proved a little challenging to get finished. I could blame it on the fact that I’m too busy eating but that wouldn’t be entirely true. Though I confess to stuffing my face with berries as you can see by my bucket ‘o blues. When people think of Oregon’s adventure sports, they think of kiteboarding in Hood River. But it’s not until you’ve been elbow deep in marionberry vines that you’ve truly experienced extreme sport. This is not an activity for wimps. This is full-metal jacket sport. But boy, is it worth it. The floral, bubble-gummy marionberry, a type of blackberry, is indeed one of the great wonders of the northwest. If this is your first visit, you’re seeing a month-by-month log of fresh produce, with a tally to see how my local versus non-local dollars compare. See April Produce Log for an introduction to the project. Here are May and June. You can download each one as a PDF. Here is July. Each month includes recipe ideas, links and PDFs to download. Scroll down for more on July’s produce, reflections on eating in summer and recipe ideas. It’s about this time in August that I want to push the pause button. I have yet to consume vast quantities of artichokes and because of that I’m not ready to see cantaloupe or even corn. 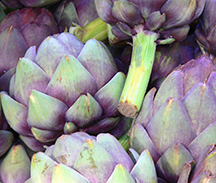 Oregon’s artichokes are about a month late due to less-than-optimal weather. This feeling of wanting to slow the tide of earthly delights is really just silly anxiety, stemming from a desire to savor as much and as deeply as possible. No one is stopping me, of course. To savor can imply taking time to create a spectacular dish. But savoring can just as easily mean standing at the kitchen counter eating a peach and licking the juice that drips down your arm. I wrote about the comforts of seasonal eating and how limiting to what’s in season simplifies and allows you to enjoy eating on a different level. The desire to freeze the moment is that the overabundance from the garden and the sheer variety from the market begs for more time to enjoy it. There are only so many opportunities to cook for friends, which is the best way to celebrate all this bounty. In the absence of guests, I bang on my neighbor’s window with a big zucchini, hand a big bunch of basil to the teenager walking down the sidewalk, or give strawberries to the guy across the street. Freezing the moment is what seasonal eating does, for better or worse. You’re up to your eyeballs in basil but you have to enjoy every leaf. For soon it won’t be there (except in frozen form, which is pretty darn good). Berries. Three visits to a local farm yielded 11 pounds of berries (a couple more visits needed), most of which go in the freezer. 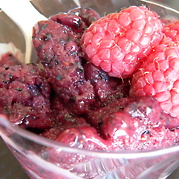 But not before making blueberry sorbetto topped with raspberries, with a little pinot noir thrown in for fun. And also not before making berry crisp, with marionberries and peaches. For those who don’t like to bake, this is a crowd pleaser and idiot proof (unless you burn it under the broiler). Make your own raspberry vinegar by tossing a handful of raspberries in some champagne or white wine vinegar in a mason jar and let sit in the sun. Strain out the berries once the vinegar has turned nice and red. Carrots & Zucchini. I bought a large bunch of carrots and then pulled more from the garden, which is too many if you don’t love carrots. 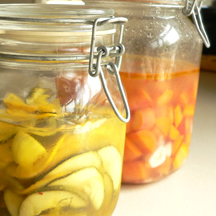 So I experimented with pickled carrots (refrigerator style) to make use of them. I loosely followed this recipe but I think I should have cooked the carrots longer. Together with my pickled zucchini (which I modified to make savory with no sugar, added garlic, dill, onions and coriander seed), I have ready snacks to put out when guests come over. See June’s log for other zucchini recipes. Arugula. It’s growing like gangbusters this year which means eating a salad a day, sometimes two. Because of arugula’s peppery flavor, the sweetness of a raspberry vinegar dressing compliments the kick. When you have too many greens you have no choice but to start eating breakfast salad. There’s at least one other person out there who wants savory for breakfast. Use any lettuce or vegetables you like. Pictured is my take on it with arugula, shredded carrots and sunflower seeds, along with the soft-boiled eggs. Beans. Last year, my beans died a horrible death. This year, I can’t keep up. I’m growing the Italian romano beans—a long, flat, wide bean with a nutty, sweet flavor that almost double in size overnight. My father used to make stewed beans that we had with polenta—the polenta being a poor man’s substitute for meat in Italy. I loved this dish; there was something wonderful about how the beans almost fell apart. I now know it’s called fagiolini in umido. Like many Italian recipes there are no hard and fast rules, unless it’s the rules of the person whose recipe you’re using. I don’t blanch my beans first and I also add torn fresh basil and shaved parmigiano at the end. Artichokes. Sorely missing from this month’s log, a bag of baby artichokes are sitting in the fridge. I couldn’t want till next month to encourage trying this recipe. La vignarola is a Roman spring vegetable stew. Because Oregon’s artichokes are late, one can enjoy a spring dish in summer. The Italians are always improvising with what’s available. The catch here is that fava beans are called for and the planets didn’t align properly for the two vegetables to co-occur. The overabundant beans (see above) will have to be the understudy for favas. Phew. A long post but there’s a lot to say. If you use one of these recipes, let me know how it goes. 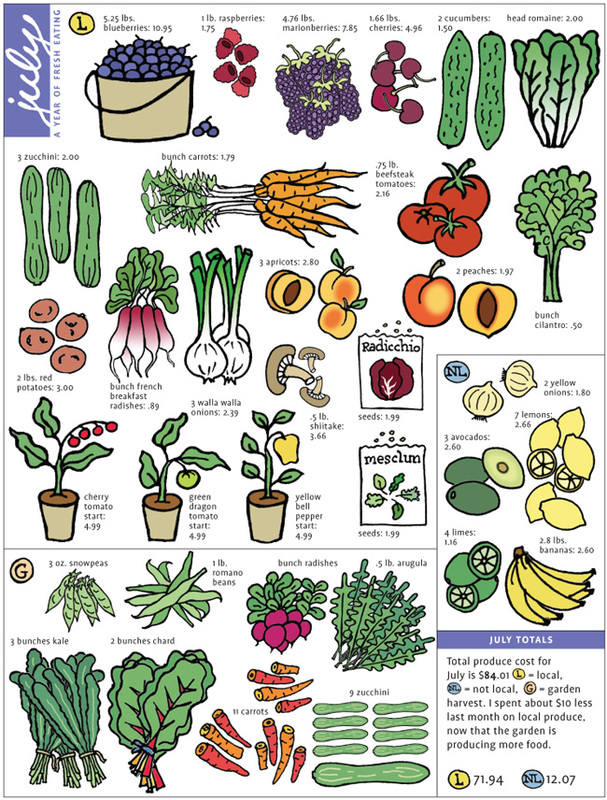 If you have a favorite recipe using one of these fruits or vegetables, please comment! You’re too kind. Working on a late-summer-must-eat post, before time runs out, of summer, that is.